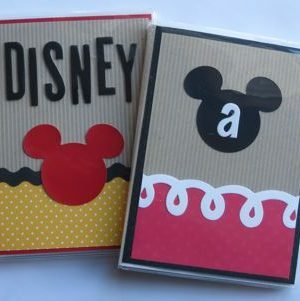 I have mentioned before that we make our own autograph books for our Disney trips and it saves us some money. 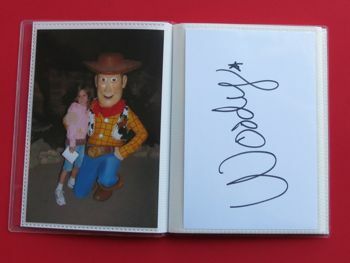 The Disney autograph books start out at $7, if you need several books that can add up fast. 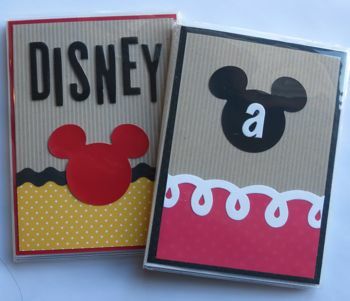 I am sharing the books that I made for our upcoming trip to Disneyland and these are by far my favorite. Plus, they cost me less than $1.00 to make!!! I found some mini photo albums on clearance at Target for $ .50, and as soon as I saw them I know I wanted to make them into autograph books (Thanks to Kami for the idea she shared last year!). I kept the cover fairly simple, by adding 2 different types of paper and then adding a border to cover where the two papers met. 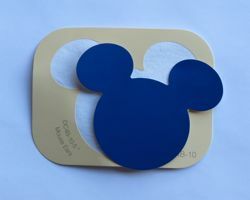 The Mickey Mouse I used on the cover was from a paint chip from Home Depot (we were checking out paint colors and I saw those cute little Mickey Mouse heads and I knew they would be great as embellishments on the autograph books, so I picked up 2 extra). They came off of the paint chip super easy! The thing I am most excited about with this new design is that I will be able to include a photo of my kids with the characters right next to the page with the autograph. So fun!! To get the signatures I just cut several pages of white cardstock into 4×6, we will bring along a Sharpie marker and a clip. 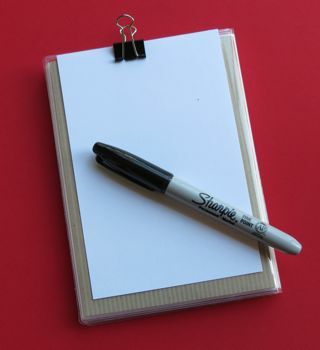 My plan is to use the clip to secure a piece of the cardstock on the back so it is easy to sign. Once they get the signature we will slide it into one of the pages and once I get the photos developed in will go on the opposite page. I think this system will also come in handy, because sometimes we need to split up because my youngest can’t ride all the rides that the older kids can ride. This way we can have some of the paper with each of us adults, so if we come across a character my son can get an autograph without worrying about having the book with him. Last year, he missed out on a favorite character’s signature, because his Mom has his autograph book and she was riding Space Mountain with his big brothers. 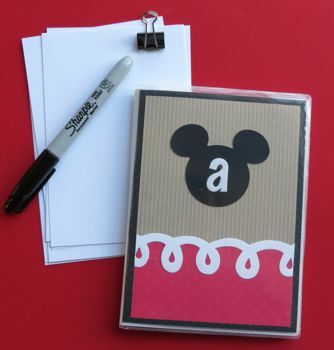 I love to hear your creative ideas for getting Disney autographs. Save Money when Dining at Disney – See how my husband and I were able to eat for 2 days and spend less than $30 out of pocket. Figure out when is the best time for you and your family to visit a Disney Park. See how much fun your kids can have with Disney Pin Trading. So we JUST got home from Disney World and I saw the COOLEST thing while we were there! This couple in front of us waiting to get autographs from Woddy and Jessie had taken plain white pillow cases, stenciled or appliqued thier childs name on them (one for each) and held them taught for the characters to sign….. the cases we FULL of multi colored signatures it was one of the best ideas I had ever seen! This was the first year Kyla was interested in signatures and we had WON an actualy Disney Autograph book at an event so thats what we used, but THIS idea got me really excited for the next visit! 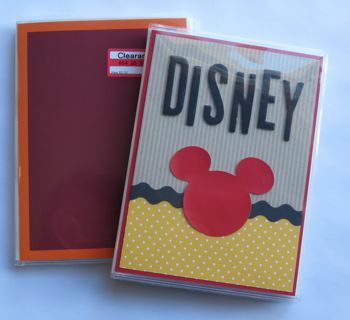 These autograph books are so cute and what a clever way to re-purpose a clearance notebook and a paint chip sample!! Just out of curiosity, how many pages do those have? I was thinking of doing these, but we will be there for 10 days, so I think we will get A LOT of autographs! Might just have to use the bind-it-all to control how many pages I have! @Danica I believe there are about 25 pages in each one. Great idea, I’m totally inspired to make my own! I found little photo albums at the dollar store where the cover slips out of the plastic so I ditch the flowers and make my own to slide into the sleeves for the front & back! I also found 4×6 index cards at the dollar store to use for the autographs so less paper cutting for me (I loathe trying to cut it straight, lol). Since you wrote this article, where you happy with this system? Would you have changed it any way? We’re leaving for our 1st trip next week & I want to make our own. THANK YOU!